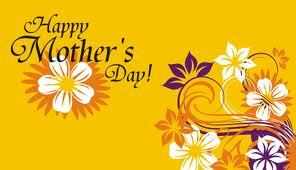 All our lives, our mothers have been our biggest cheerleaders and our most ardent allies. Want to go beyond the traditional Mother’s Day greeting card and flowers this year? 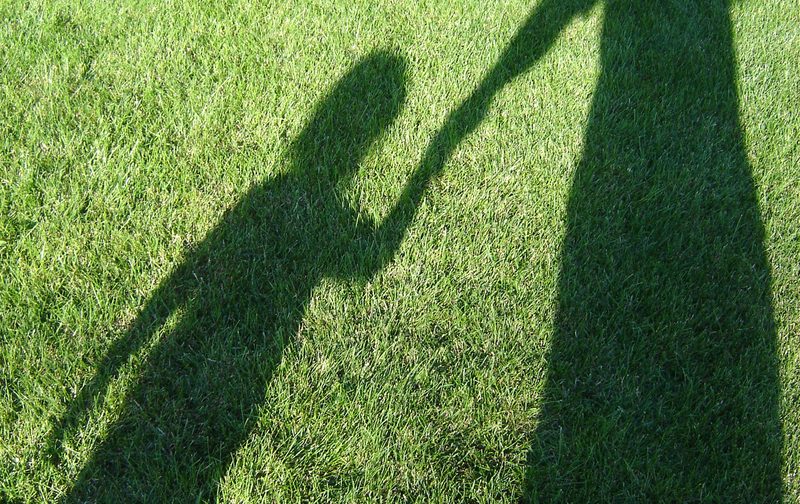 Here are some creative ways to celebrate mom on her special day. Write a beautiful letter to her. Whether you are young and still at home with mom, or grown with your own children, you likely have many examples of the ways that your mother is special. The letter needn’t be long, but it should be personal and specific. Not sure where to start? Sometimes creating a themed list can loosen those creative juices and get your writing flowing. List the ways she’s helped you over the years; her delicious recipes; or most quotable quips and sayings that have saved you/inspired you/made you smile. She’ll likely want to save this letter, so write it on pretty stationery, such as the Anthony Letter Sheet. Plant flowers. Cut flowers from the florist are lovely, but try something different and give her a living plants she can enjoy this summer or all year long. Help her set up a container garden, filled with tomato plants or herbs. Create a window box filled with colorful annuals. Research native plants that grow in your area that attract special wildlife, such as butterflies or hummingbirds. Shhhhh….kidnap her and take her on a picnic. Tell her to be ready at a certain time for an “outdoor adventure.” Pack a picnic, and bring her to a pretty natural area or park for dining al fresco. Bonus points if you go for a walk or bike ride. Remember to take a selfie with her, then put the photo in a pretty frame, such as the Mother’s Day Picture Frame. Bake together. Even if you use a boxed mix and store-bought frosting, you can create a pretty layer cake or mini cupcakes. Don’t forget the sprinkles. This is especially fun with little kids. 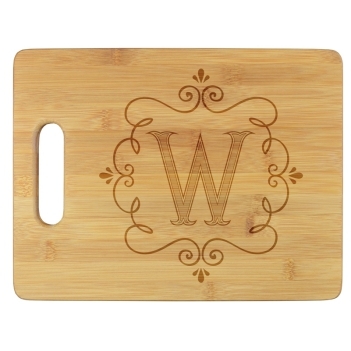 Serve cupcakes or cookies on the Valentina Cutting Board personalized with her initial. Donate or volunteer to help women. Sometimes the most meaningful gifts are the ones we spend in service to others. Sign up to volunteer at a food pantry or shelter. Knit baby caps or quilt baby blankets for drug addicted or sick babies. Ask your community’s women’s shelter what they need and go shopping for sanitary supplies or clothing. Celebrate Mom’s love on Mother’s Day. Moms are amazing. Who else can get you to ballet practice in a torrential downpour while humming “Singing in the Rain”? Who else puts in the time and thought to plan a healthy, tasty family dinner so everyone can reconnect and laugh after a busy day? And who can wipe away a toddler’s tears and have her singing “Let It Go” as passionately as Elsa from the movie Frozen? Hint: her name is spelled Wow upside-down. All those beautiful moms work in and out of the home 24/7. Give them personalized stationery gifts that add a touch of luxury to their day. Even if they’re in their yoga pants on their third cup of coffee, when they pull out this stationery, they’ll feel like the Queen of England. Classic Frame Monogram Note This folded note brings a classic and refined design together with the smooth and carefree lines of a script typeface. A delicate border binds your monogram in the center. The country’s top embosser and monogram designer produces and designs this note. Wow Mom with the Damask Note for Mother’s Day. She’ll treasure this beautiful work of art from Giftsin24. Anthony Note A fun and timeless way to showcase Mom’s name. Let her be the star of the moment and enjoy the spotlight. Customize this card in a variety of ink colors, and add an optional lining to the envelope to make it extra special. Damask Note Simply the best! Mom will enjoy the feeling of running her hands over this luxurious embossed design. This is the type of work we are known for in the social stationery industry. A true work of art, the Damask Note features an ornate composition used in the decorative arts for hundreds of years. 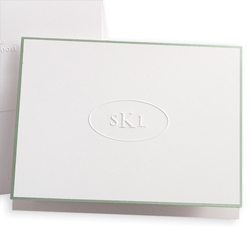 The crisp design pops in white or ivory triple-thick paper. Her name will appear in shiny raised ink. Choose from among many lettering styles and ink colors. Longtime Giftsin24 customers know our products shine above the competition’s. 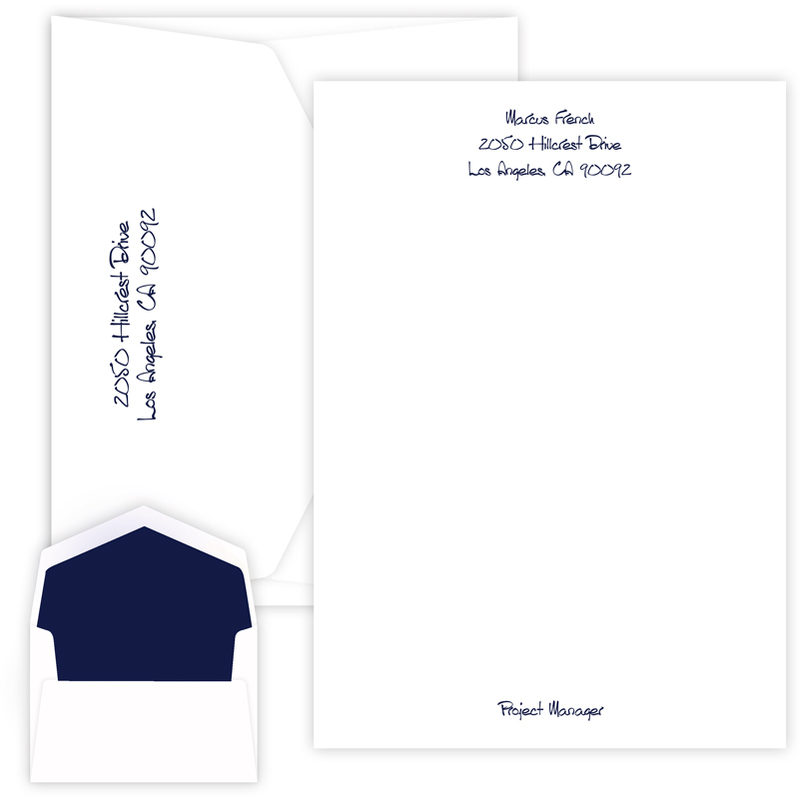 One reason is our color-matched, perfectly fitted, beautifully crafted envelopes. 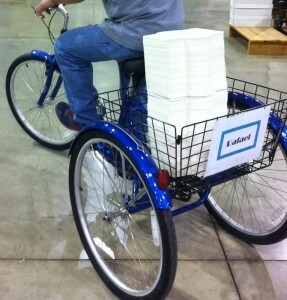 That’s because we make all our envelopes right here in our state-of-the art manufacturing plant in Aurora, IL. We have total control of the process, from start to finish. Plus, our sole focus is on creating a perfect product and delighting you, our customer. mismatched stationery and envelope papers. Ivory stationery and white envelopes? Never from us ! envelope proportions don’t match stationery. For example, there might be 1/2 inch extra space on the sides and 1 inch of extra space on the top and bottom. Yuck! too much room in the envelope. For example, the stationery rattles around inside the envelope–there’s no need for that ! 2. 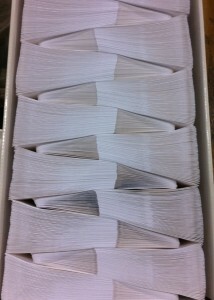 Our expert envelope makers have been making envelopes for decades. They work within tiny tolerances to ensure that each of your envelopes is absolutely perfect. In addition, we don’t give our envelope makers quotas. If one doesn’t turn out, it goes into the recycle bin, and the crafts person starts with new paper. 3. 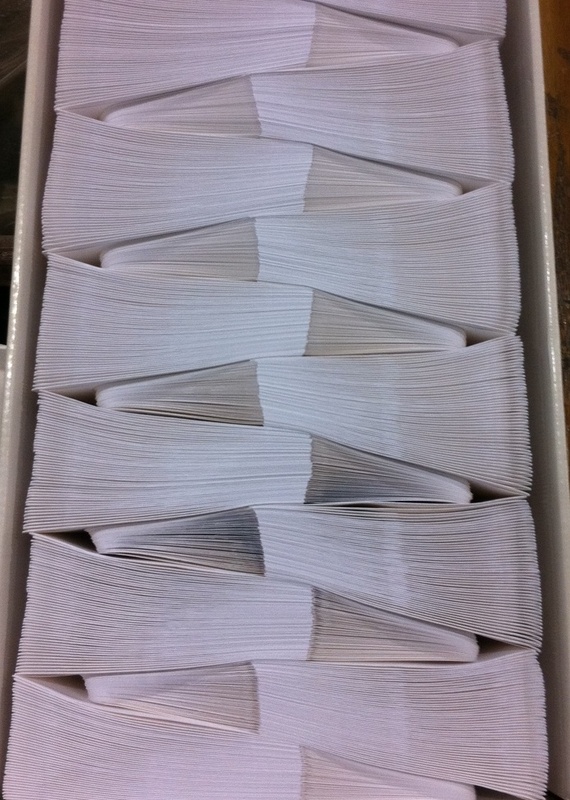 We cut and fold our envelopes to our highest quality standards. Consequently, when you insert the matching stationery, it fits like a glove. It’s all in the details ! Mother’s Day is on its way. Are you ready? 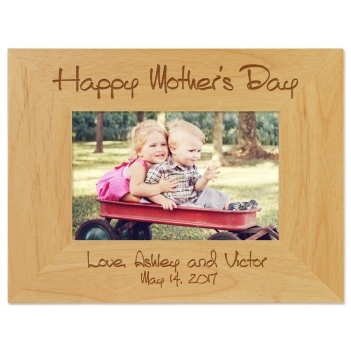 We have gifts that are personalized and beautifully crafted. Your mom is a special person. She does so much for her family, and often with very little thanks. She’s cook, maid, chauffeur, nurse, care-giver, nurturer, decorator, gardener and sometimes sole provider. She praises, encourages, supports and understands. After staying up late to help you finish your school projects, she makes you breakfast in the morning. She always displayed your artwork proudly on the fridge. She even kept the macaroni-encrusted “jewelry box” you made her! Mother’s Day is the perfect occasion to show her how much she means to you and how much she’s appreciated. What will you do for your mom this Mother’s Day? Will it be breakfast in bed? Perhaps a gorgeous bouquet of flowers or some jewelry. Maybe you’re just going to spend the day with her and the family. The Damask Note is elegant and stylish. 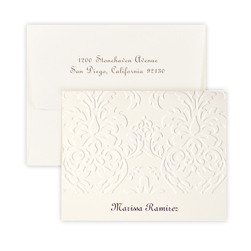 Damask Note – Elegant embossing and a raised-print name combine to create a note she’ll love to use. Family Pride Note – Let Mom show off her family pride with the names of all her family members! 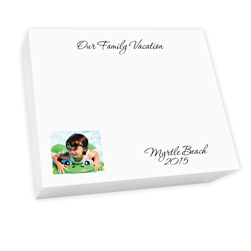 Family Photo Memo Square – Mom can jot notes, lists and ideas on these handy squares that feature a photo of her favorite people. Henley Traditional Monogram Note – A classic. Lovely script monogram deeply embossed on a simple, yet stylish, note. Somerset Wardrobe – The original three-card wardrobe that makes the perfect gift.